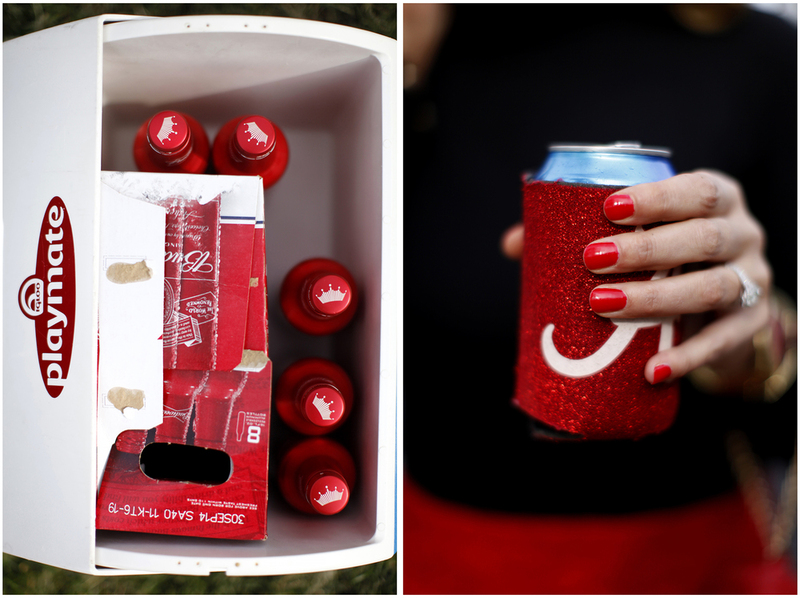 Left: Jessie Wimsett's, a WKU alumnus, cooler holds the contents for a game of "beersbie" during tailgating in the Valley at Western Kentucky University on Saturday, Nov. 8, 2014. Beersbie involved balancing a bottle of beer on a pole and knocking it down with a Frisbie. "It's the funnest tailgating game ever," Wimsett said. Right: Jenna Rusin, a 2009 WKU alumna, drinks her beer from a red Alabama coozie during Homecoming festivities on Saturday, Nov. 8, 2014. 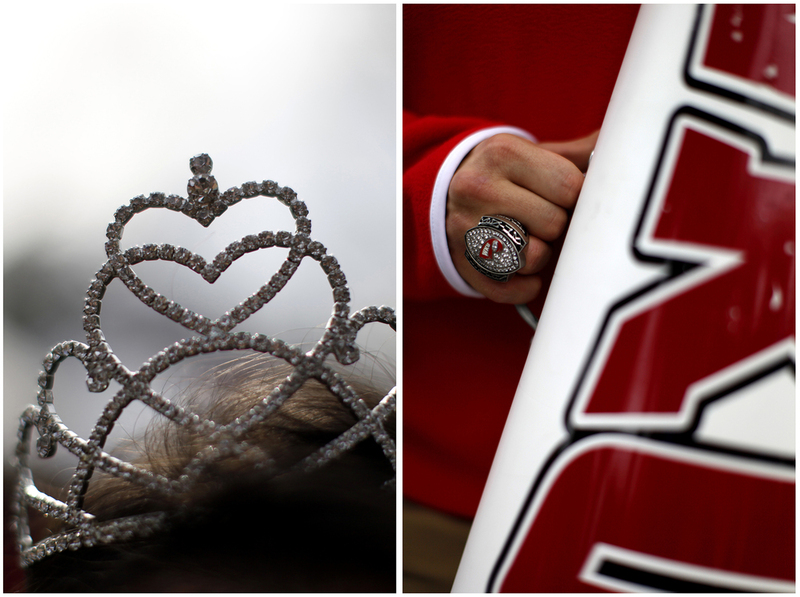 Left: Taylor Emberton, a Glasgow alumna and 2013 Homecoming Queen, wears her crown during tailgating festivities at Western Kentucky University on Saturday, Nov. 8, 2014. Right: Andrew Pettijohn, WKU alumnus, wears his 2012 Little Caesar's Bowl ring from his time as a football player at WKU. "I used to play football, now I just carry this megaphone around," Pettijohn said. Left: Big Red, WKU's mascot, poses for a portrait along the Avenue of Champions at Western Kentucky University on Saturday, Nov. 8, 2014. Right: Shelley Spalding, a Lebanon senior and Honors College Homecoming Queen candidate, wears her newly pinned Homecoming mum after the pinning ceremony at the WKU Chandler Memorial Chapel on Saturday, Nov. 8, 2014. Left: A sparse crowd cheers on the Tops at L.T. Smith Stadium at the 2014 Homecoming game on Saturday, Nov. 8, 2014. 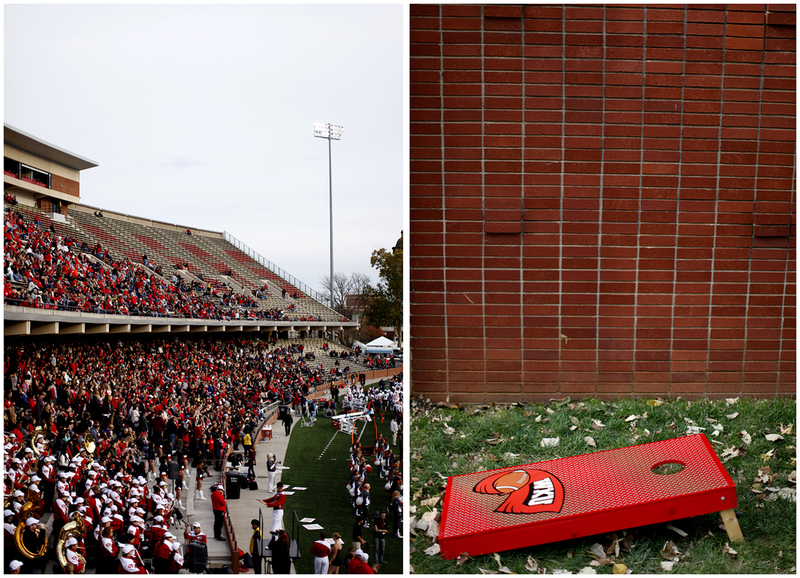 Right: A corn-hole board sits during Homecoming tailgating in the Valley at WKU on Saturday, Nov. 8, 2014. Left: Cecile Garmon, a communications professor at WKU, poses for a portrait in her red Liz Claiborne glasses. Garmon has been a professor since the 1980's and has sported her collection of colored glasses since the 80's as well. She has colors from orange to green and says she wishes she would have bought every color when Liz Claiborne came out with the glasses in the 80's. "I love Homecoming, but it isn't as much fun as coming to class everyday," Garmon said. 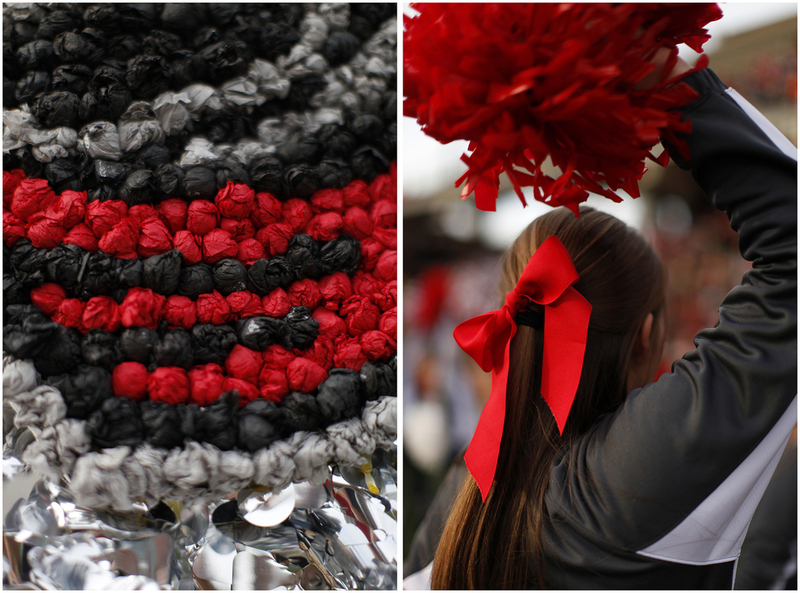 Right: WKU cheerleader's pom-poms rest on the sidelines of L.T. Smith's Stadium during the Homecoming game on Saturday, Nov. 8, 2014. 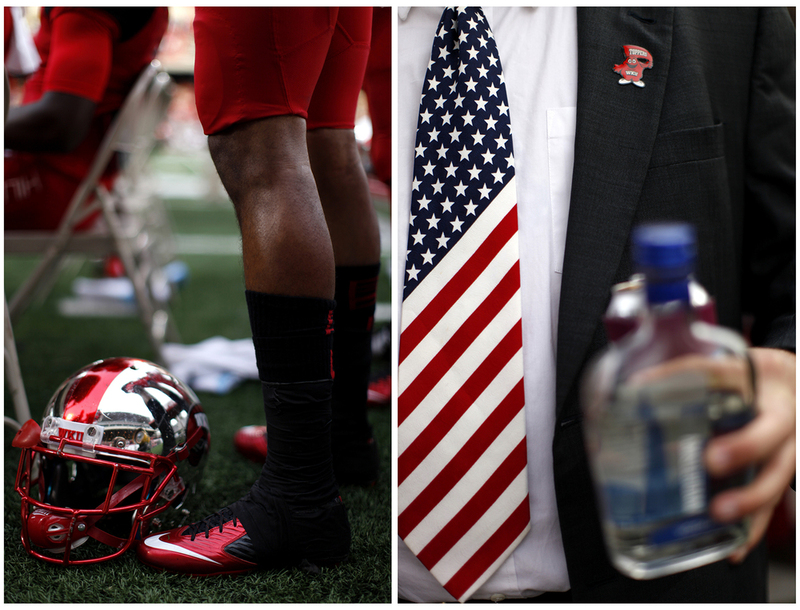 Left: WKU football players rest on the sidelines during their game against UTEP on Saturday, Nov. 8, 2014. WKU won 35-27, securing their first Homecoming victory in three years. Right: Matt Livingston, a Richmond senior and Pike fraternity member, tailgates in the Valley at WKU during Homecoming festivities on Saturday, Nov. 8, 2014. "Homecoming is great because you see old friends you only get to see every year or two. It's the best time of year," said Livingston. Left: Hillary Chinn, a Lexington aluma and Kappa Delta sorority member, poses for a portrait during Homecoming tailgating on Saturday, Nov. 8, 2014. Right: Corneshia Jackson, a WKU grad student and Homecoming court representative for the African American Student Association, wears red wedge shoes as part of her Homecoming ensemble on Saturday, Nov. 8, 2014. 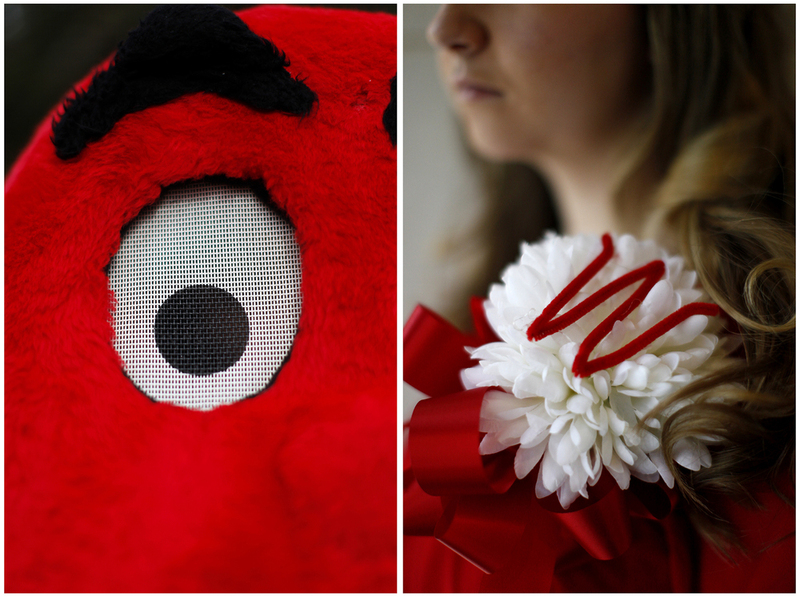 Left: Jayna Kubuske, a Toledo Ohio senior and WKU Feature Twirler, clipped WKU accessories into her hair for the Homecoming celebrations at WKU on Saturday, Nov. 8, 2014. Right: Ashleé Robinson, a Nashville senior and captain of the Major Redz, leads her team in a dance routine at the Homecoming game on Saturday, Nov. 8, 2014. 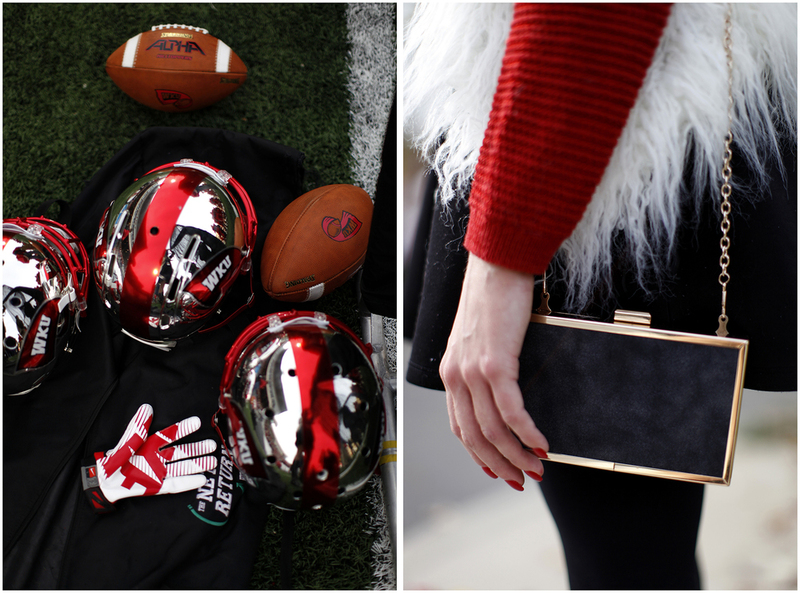 Left: Football equipment rests on the sidelines during WKU's Homecoming football game on Saturday, Nov. 8, 2014 in L.T. Smith Stadium. Right: Rachel Sheldon, an Owensboro senior and fashion major, mixes several different textures in her outfit for Homecoming on Saturday, Nov. 8, 2014. Left: Homecoming floats are displayed along Avenue of Champions during Homecoming festivities on Saturday, Nov. 8, 2014. Right: Ashley Begley, a Nicholasville junior and cheerleader, cheers on the sidelines of WKU's Homecoming game in L.T. Smith Stadium on Saturday, Nov. 8, 2014. Left: Dejon Brown, a junior and linebacker, watches his team play it's game against UTEP on Saturday, Nov. 8, 2014. WKU won 35-27, their first Homecoming victory in three years. Right: Angela Cook, a senior and drum major, poses for a portrait while the WKU band gathers together in the Avenue of Champions at WKU on Saturday, Nov. 8, 2014. 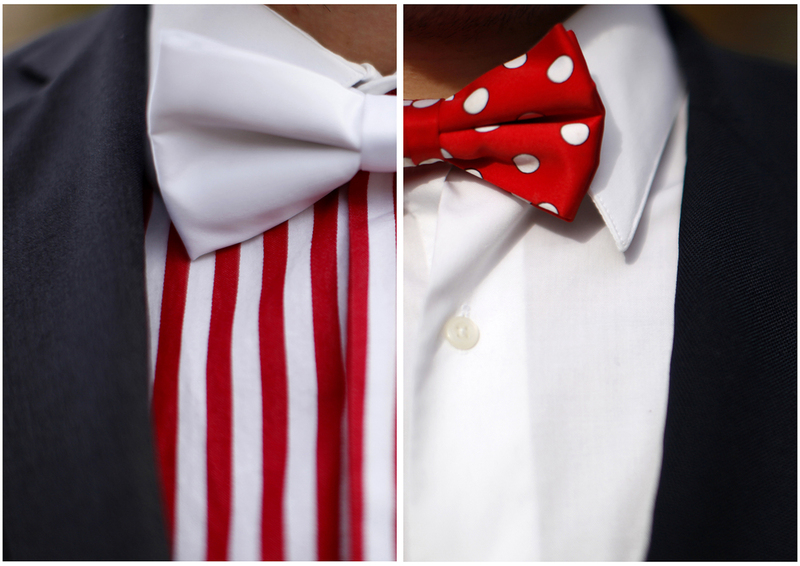 Left: Nick Courtney, a junior and Pike fraternity member, wears a stripped shirt and white bow tie during Homecoming festivities on Saturday, Nov. 8, 2014. Right: Sean Landry, a senior and Kappa Alpha fraternity member, wears a white shirt and polka dot bow tie during Homecoming festivities on Saturday, Nov. 8, 2014. Left: Parker Kuhn, a Lexington junior and Fiji fraternity member, poses for a portrait during Homecoming tailgating on Saturday, Nov. 8, 2014. Right: Rose Damron, a Lexington sophomore, poses for a portrait during Homecoming tailgating on Saturday, Nov. 8, 2014. 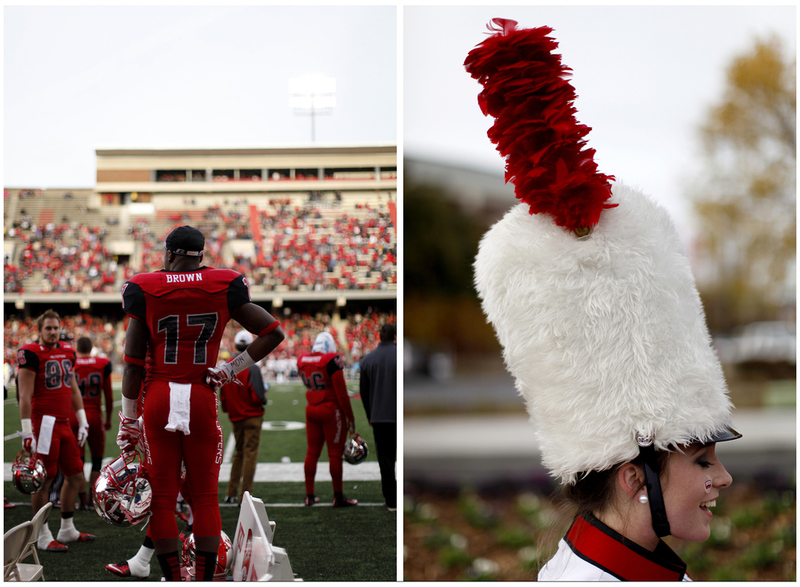 Diptych scenes from Western Kentucky University's 2014 Homecoming festivities.